Highly reccomended. If I get a chance to get down to the Melbourne GTG, Ill have this with me. Who's making the strings for EBS? Davin, you are a madman!! HAHA!! Such a killer board! 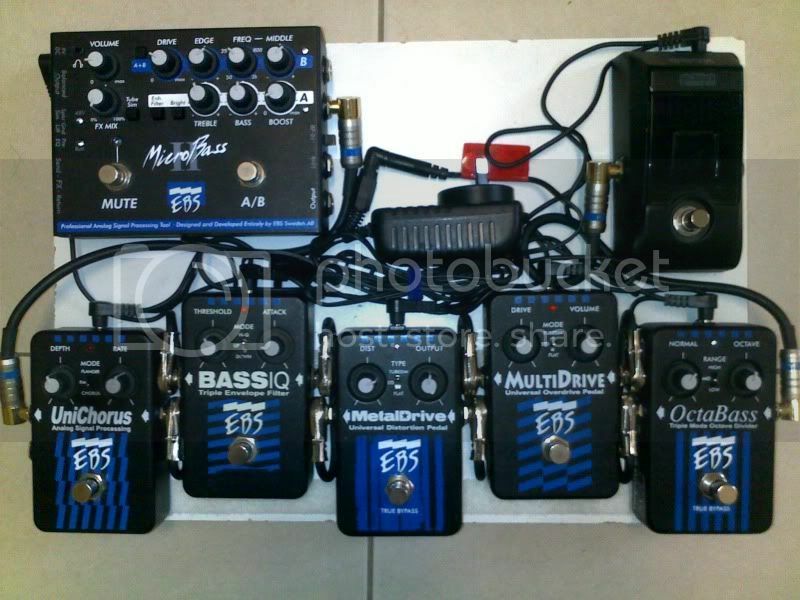 My board keeps going in the less and less direction so the EBS pedal collection stays with the Multidrive - well, 2 of them! jcarruth20 wrote: EBS Stainless and Nickel Strings in 4 and 5 string are up and online for purchase now. The Stainless Steel strings are made and produced in the USA. The quality is amazing and sound and long lasting to match. Something to definitely test out. Includes freight free Australia wide! Gonna finally be sticking a set of these on my jazz this week. Will post a review in the next week or so. The Stainless Strings are made in the USA and the Nickel are China. Sound and long lasting tone on Stainless are amazing. Get onto nickel soon! Slashin Velvet! That is best board setup i have seen! ^That explains why the Stainless are more expensive. Why are they made in different countries? EBS believe that they needed a high quality and medium quality string. Hence the different production locations. So far i have got both Stainless and Nickel on both basses and they are still ripping after 3 months. But the Stainless you can certainly feel the quality! Latest review from the Australian Musician on the EBS Reidmar head and Classic line cabs! EBS Bass is pretty much an unknown brand in this country, so it’s great to see the guys at Thump music stretching out and educating our collective tonal palettes with a seriously exciting product range. At first, I easily wrote these guys off, thinking that because of the compact, light design of the Reidmar head and Classic Line cab, along with the miniscule RRP, that these products had to sound small and wimpy. How wrong I was. The Reidmar weighs in at only 3.2kgs but pumps out 250 watts RMS of class-D power, with a peak of 470 watts, so clever engineering blends an analogue preamp with a digital power amp to achieve this result. The front panel features a ‘Character’ switch (which acts as an EQ filter), Gain, Compressor/ Limiter, ‘Filter Active’ switch (engages EQ), Bass, Middle gain, Middle frequency, Treble, Bright and Volume. On the back there’s 2 x 4-8 ohm Speakon out, Phones out, Line out, Effects Send and Return, and an XLR out with Pre/ Post and Ground/ Lift switches, so this head is packed with just about every feature any bass player could ever need. First off, let me say that just by plugging in and leaving all the settings at 12’o clock this amp sounded perfect, with a full, rich and loud sound. Its 250 watts sounds more like 750 watts and the 12-inch speaker pumps so much bass it’s ridiculous, it just doesn’t make sense. The ‘Character’ switch works like a mid scoop control for a modern tone, whereas the ‘Filter Active’ simply kicks in the EQ. Personally, I thought the amp sounded great without having using the ‘Character’ switch, and the massive headroom in the EQ section was more than enough to achieve the tones I desired. Pumping the gain and compression and using less volume gave me a more saturated sound, which is the sort of sound I try to achieve in most of my studio sessions and at gigs by using outboard compression and EQ. This made the strings wonderfully sensitive and light to the touch, rich with harmonics and overtones, perfect for finger style players. The onboard compressor was also very effective at reducing dynamic range without squashing the attack of the note, keeping the original sound in tact. The Classic Line 112 cabinet was also a gem. Not only was it so small and portable, it was cable of pumping seriously low frequencies making the walls shake and giving you the excitement of feeling bass kicking you in the legs and vibrating in your chest. I found the EBS Reidmar and Classic Line cab to be one of the most exciting bass products I’ve come across in a while. Don’t let the lightweight, compact design fool you either, this amp sounds much, much bigger than it looks. EBS & Thump Music are looking for potential endorsed artists in each state around Australia. Everyone knows the quality in EBS. We are looking for players that are playing in your state frequently, good at promoting product you use, great at doing demo video's. The list goes on. If you are interested and believe you can assist then email through and lets see what we can do.